People in Austin are going to extreme lengths to recharge their iPhones, iPads and other digital devices. Folks are apparently so desperate for a boost they are willing to pull out their USB cords and plug them into a stranger’s jacket or pants. 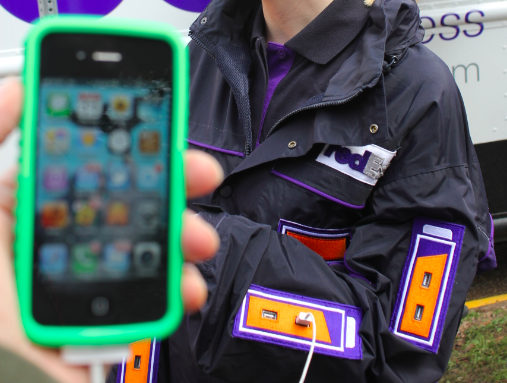 FedEx has six people running around South by Southwest in USB-charger-equipped outfits. The specially equipped coat and trousers are filled with dozens of ports tied to Mophie battery packs. The shipper is also offering up another kind of recharging — serving up free lunch from a FedEx-branded food truck, along with the option to eat at picnic tables with built-in USB and power ports. FedEx is looking to both build goodwill with entrepreneurs and tout a relatively new mobile app that lets people ship packages without ever printing a label. Sunday’s shrimp po’boys, served up in a “lunch box” reminiscent of FedEx’s signature shipping packages, were a particular hit, though some also took the time to plug in. “All I need is coffee,” said digital marketer Bradley Shende, before noticing that gratis java was also available. FedEx is far from alone in trying to grab an audience by offering a power boost. Samsung, which places its recharging stations permanently at airports and other public places, has one of the stands at its booth. AT&T has a number of recharging lockers that let visitors lock up their phone while it charges, allowing the owners to do other things. Google has a station with lots of USB cords in its Android booth — though, not surprisingly, there are no iPhone dock connectors. Getting enough juice for one’s digital gadgets has become an increasingly important issue at tech events, including January’s Consumer Electronics Show. Of course, there are also plenty of people at the Austin Convention Center, like every conference, sitting on the floor next to any available outlet. And, for those who aren’t plugged in, Foursquare’s Dennis Crowley offered up a public service announcement on Twitter, specifically addressing all the newbies to the event. “Don’t forget ‘ABC’ (Always Be Charging),” he tweeted on Saturday.